What is an A3 report? An A3 report is simply an 11 x 17 inch piece of paper outlined into several structured sections. The exact structure depends upon the type of A3 and the needs of the situation. A general one consists of the following pattern 1) Background, 2) Current Situation & Problem, 3) Goal, 4) Root Cause Analysis, 5) Action Items / Implementation Plan, 6) Check of Results, and 7) Follow Up. The report is used to standardized and simplify report writing, proposals, status updates, and other common methods of communication. The content follows the logic of the Plan-Do-Check-Act cycle. Where does the term A3 Thinking come from? 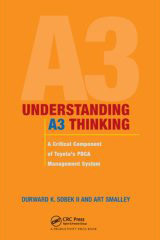 The term A3 Thinking was coined in English by our mutual friend Al Ward who passed away several years ago in an unfortunate accident. In Japanese it is simply referred to as "A san" where "san" is the pronunciation for the Japanese number three. There is really no single inventor of A3 reports. Former manager of training at Toyota Isao Kato describes it more as a combination of forces including the PDCA cycle, the basic steps for a QC circle, the Toyota concept of making things visible at a single glance, and the humorous anecdotes of Taiichi Ohno refusing to read more than the first page of written reports. Instead he'd say "let's go and see" and make people "get the facts" while he tested their thinking. How is it used inside of Toyota? There are a variety of uses that we were exposed to in our respective time inside Toyota some time ago (Prof. Sobek conducting dissertation research and Mr. Smalley as an employee). Three uses that are most common are 1) structuring thinking and telling a concise PDCA story, 2) generating discussion with supervisors or other departments for feedback, and 3) mentoring in terms of problem solving skills development. There are others but these are probably the most common starting points. Does everyone use them inside Toyota? A3 reports are far more common than you might think. Virtually every employee has written one at different parts of their career. Far fewer people inside Toyota for example have ever drawn a value stream map or even a standardized work chart by way of comparison. The A3 concept is one that just about every person in the company has applied at some point in time and usually quite often. Today they are not used as often as in the past due to the development of the company. Still the embedded thinking process makes up an important part of the culture and language. How does A3 relate to other lean tools and concepts? It really compliments anything in TPS (Lean Manufacturing). In fact we sort of cringe at the notion of calling it a tool. The last thing we want to see is another movement of starting QC Circles or drawing Value Stream Maps just for the sake of the activity. A3 Thinking is about a logical and critical thinking process that can be applied in any discipline. Think of it is a thinking pattern to be used in problem solving, improvement or any activity rather than a tool. Do all A3 reports follow the same outline and look alike? Not at all. In fact you'd struggle to ever find two that looked alike. Other than the fact they fit on one sheet of paper and have common sections they are usually quite different when you read the content. Do you really only get to use one page? The basic concept is indeed to put the main storyline on one 11 x 17 inch sized A3 paper. You'd be surprised how much you can communicate on a single page once you put your mind to it and eliminate the unnecessary information. When there is a lot of technical data or an engineering drawing for example used as an additional reference of course it can be provided as an attachment. Why would I go to all the trouble to put this information on one sheet of paper? The flip side to the question is really why are you making the reader wade through dozens of pages, flip charts, PowerPoint slides, and hundreds of e-mails? Somehow we have substituted quantity of information in place of quality of communication in recent years. The book Understanding A3 Thinking is a good place to start. There are different consultants that specialize in this topic and certain organizations offer some training. The best way is to learn by doing however and have someone with experience critique the contents for you. As time allows we'll see if we can put more information on the website.